The Knautilus is a large submarine which belongs to the evil Baron K. Roolenstein. 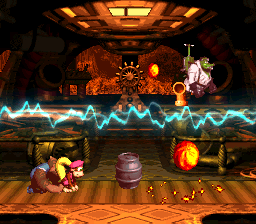 It is where Dixie Kong and Kiddy Kong's final battle against Baron K. Roolenstein takes place in Donkey Kong Country 3: Dixie Kong's Double Trouble! and is located in Krematoa. Not much about the Knautilus is revealed, such as the full extent of its abilities or weaponry, if it possesses any at all. Inside the Knautilus is a large conveyor belt located on the floor of the submarine, as well as a cannon that can launch fireballs. Large, circular devices on the walls of the Knautilus are also shown to shoot electricity. The Knautilus also appears in the opening cinema of the game's Game Boy Advance remake, where it appears just before the game's title screen; here, the Knautilus opens its front end just before propelling itself at the screen, giving the illusion that it has "swallowed" the screen. A glitch can be executed in a later phase of the battle, in which the game can be paused while the bottom two weapons are shooting electricity, and rather than stopping their movement, the electricity can move and pass through objects, causing various results. It is probable that the Knautilus is named after the Nautilus, a submarine from the novels Twenty Thousand Leagues Under the Sea and The Mysterious Island. The GBA version's intro could possibly be a depiction of how Donkey Kong and/or Diddy Kong were captured by the Kremlings, since the intro starts with a point-of-view shot of someone wearing a diving mask, which ends with the Knautilus closing in and "swallowing" the camera, followed by the next shot showing the Knautilus rising out of the water. This page was last edited on March 30, 2019, at 21:50.